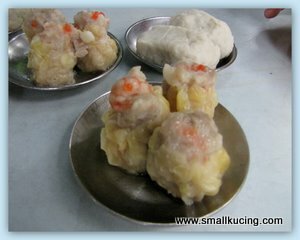 SMALL KUCING: Phang Kee Dim Sum at Happy Garden, Old Klang Road. Phang Kee Dim Sum at Happy Garden, Old Klang Road. That morning, Mamarazzi was very excited. It was the morning of the Big Bad Wolf Aftermath Sale. She woke up early and kicked everyone bum bum woke up everyone. Just imagine....7.30am already wanna leave the house padahal the sale don't starts till 10a.m. We went pick up Auntie Florence and decided to have Dim Sum at Phang Kee Dim Sum. Ordered some Siew Mai. The shape a bit ugly but taste pretty good. Has some other type of Dim Sum. The bottom left one with Prawns were pretty good. Bottom of it was Japanese Tofu. I think Ah Mah liked the Fishball coz she requested one more plate of that. Hongkong Chee Cheong Fun. Taste great with the Sambal. Mamarazzi love the porridge. A lot of liu inside it. 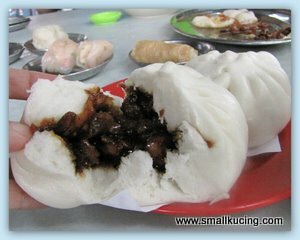 The pau were not bad too. 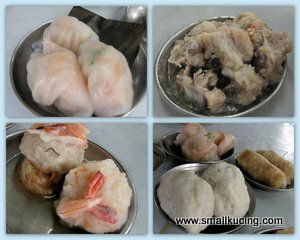 This dim sum shop is located at Jalan Lazat, Happy Garden. The place is well know as Wai Sik Kai in Happy Garden. I can see you had a great day..
oh nice, especially the pao!! i haven't had dimsum for such a long time already..
Hahhha....yea,that's early. When ur mamarazzi called me, I was still on the bed. Wow! A breakfast of tim sum before went for a book shopping spree huh? Small kucing must be sleepy waking up that early. I will go for the Hong Kong Chee Cheong Fun because with the rest, its pretty heavy for me as I normally don't have breakfast or the mos something of a small portion. I normally go for the prawn version with plenty of chillies on top. 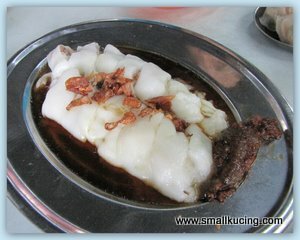 yummy che cheong fum.. i love it!!! how come? Keep fit ah?